Unifirst, Cal-Maine, and Simply Good Foods investors could be in for an extra volatile trading period ahead. 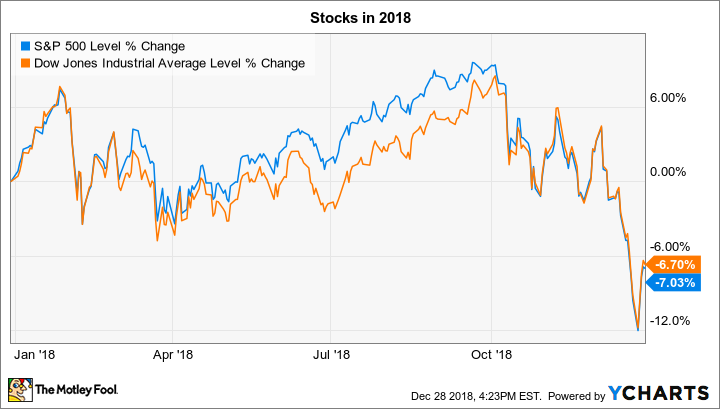 Stocks gyrated between significant losses and gains in the final full week of 2018 trading, but the Dow Jones Industrial Average (DJINDICES:^DJI) and S&P 500 (SNPINDEX:^GSPC) both ended up rising by less than 1%. That left the two indexes each down by roughly 7% for the year. It's a shortened holiday trading week ahead that ushers in 2019. A few stocks could stand out, though, as they announce quarterly results over the next few days. Below are a few key metrics investors will be watching from reports by Unifirst (NYSE:UNF), Simply Good Foods (NASDAQ:SMPL), and Cal-Maine Foods (NASDAQ:CALM). Uniform and textile giant Unifirst will announce its fiscal first-quarter results before the market opens on Thursday. Its last report was strong, with sales rising 5% in its core laundry segment and by 11% after including the positive impact of recent acquisitions. Adjusted profits rose at a faster pace, although the company reported a net loss for the period that was driven by one-time charges. CEO Steven Sintros and his team predicted back in October that revenue for the new fiscal year would range between $1.63 billion and $1.65 billion compared to last year's $1.59 billion. Earnings per share should range from $5 to $5.30 to mark a solid improvement over 2018's $3.44. But investors could see updates to both of those targets on Thursday that reflect the chain's latest demand trends. Simply Good Foods hasn't been around in its current form for long, but investors like what they've seen so far from the young consumer packaged foods company. Sales rose 9% in fiscal 2018 thanks to the strength of popular marketing campaigns that supported its Atkins and Harvest Trail franchises. Shareholders are hoping for that positive momentum to continue into 2019 so that the company can again surpass its long-term growth goal of 4% to 6%. In addition to those market-share gains, the company is aiming for more improvements in its gross profit margin, which would suggest solid demand even in the face of price-based competition in the nutrition bar and ready-to-drink shake industry niches. Cal-Maine Foods, the largest egg producer in the country, will announce its results on Friday morning. Its stock has trailed the market by a wide margin in recent years due to unfavorable moves in egg prices and a shift in demand toward cage-free, organic, and nutritionally enhanced eggs. The company can't do much about price volatility, but it has been making aggressive moves to position itself to serve consumers' rising tastes for those specialty products. Cal-Maine is also pressing its scale advantage, including through the recent acquisition of Featherland Egg Farms that just added 600,000 laying hens and new distribution nodes to its production and fulfillment capacity. CEO Dolph Baker and his executive team will likely discuss the integration of that new business on Friday. But investors should be even more interested in cost trends, given that spiking expenses for feed grain are pinching profitability these days. "In spite of changing market conditions," Baker said in early October, "we remain focused on aspects of our business that we can control." For their part, Wall Street pros are expecting sales to hold roughly flat at around $363 million as earnings drop to $0.50 per share from $0.55 per share a year ago.